Dr. Fred Freeman, expert commentator on the fascinating Paisley born weaver-poet, Robert Tannahill (1774 – 1810), set the scene for this feast of the poet’s songs and musings, especially focussed on the Irish immigrant population of the 18th Century. Those immigrants had been made to feel as welcome as the 17th Century Scots had cherished the Highlander migration and last century welcomed the ex-empire immigration from the West Indies and Indian sub continent. 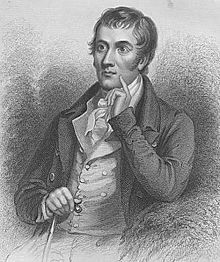 Tannahill however found himself drawn to these impoverished souls’ plight and collected their melodies and tunes writing verse to praise, eulogise, gently mock and even satirise their homeland which he called by the poetic title of Erinn. A marvellous cast of traditional musicians brought the music to life and voice. Notable were Fiona Hunter, Brian O’hEadhra, John Morran, Lucy Pringle and Wendy Weatherby. 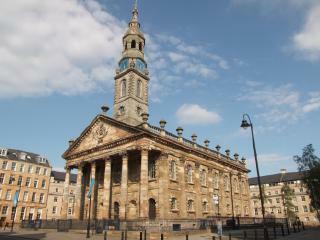 By clever positioning different combinations, utilised the stage in St Andrew’s in the Square and the musicians Sandy Brechin, Marc Duff, Aaron Jones, Angus Lyon, Frank McLaughlin, Richard Werner and Chris Agnew, ensured that there was never a dull moment. In play were mandolins, accordions, guitars, flutes and an electric piano, and each musician made their instrument zing. Not only did I leave the concert with the distinct feeling that I learned a lot about this important early Scots poet, but I also found myself humming a tune and recalling that ‘Will ye go lassie go’ derives from Tannahill’s song ‘The Braes of Balquhidder’. Well worth the purchase of a CD from the 3 volumes so far released.